I have a friend who said she can tell teachers from the general population because they always dress "appropriately" on holidays! Do you have on green today? Some things never change! Have you made your plans to attend CEC and all of the CASE events! Make sure your plans include you arriving so you can attend the CASE member/board meeting on Wednesday, April 9. We will begin with a great, full breakfast buffet, sponsored by eSped at 7:30-8:30 and then the meeting starting at 8:30 and going until about 4:00. Awards will be sponsored by Stetson & Associates. We always have an awesome break in the afternoon and this year it is sponsored by Scholastic, Inc. During the annual member meeting we will be having an update on policy issues by the CEC Policy and Advocacy unit, hearing about the upcoming membership changes from the CEC Membership unit, hearing the results of the CASE election, and providing input to the CASE leadership on the upcoming projects and possible projects. Once again, this year our Showcase session will be on Thursday morning and will be Julie Weather, Esq with her great legal update! The Showcase will be sponsored by Scholastic, Inc. If you have attended this session in the past, you know we always run out of room. I don't think we will this year — CEC has scheduled us in a great lecture hall that seats 600 people so invite everyone to come hear this great speaker. Her handout alone will be worth the effort! CASE Night, co-sponsored by C8Science and Star Autism Support, is going to be a great event as always this year! Just think, heading out to the ballpark with 174 of your colleagues on Thursday, April 10 for food and a great ballgame! We will have appetizers, dinner, cash bar and lots of fun at a pregame tent party at the Citizens' Bank Park and then we will be sitting together for the Phillies vs. Brewers game! Click here for the flyer and click here to purchase your tickets! CASE Night sells out almost every year ... don't delay on getting your ticket! 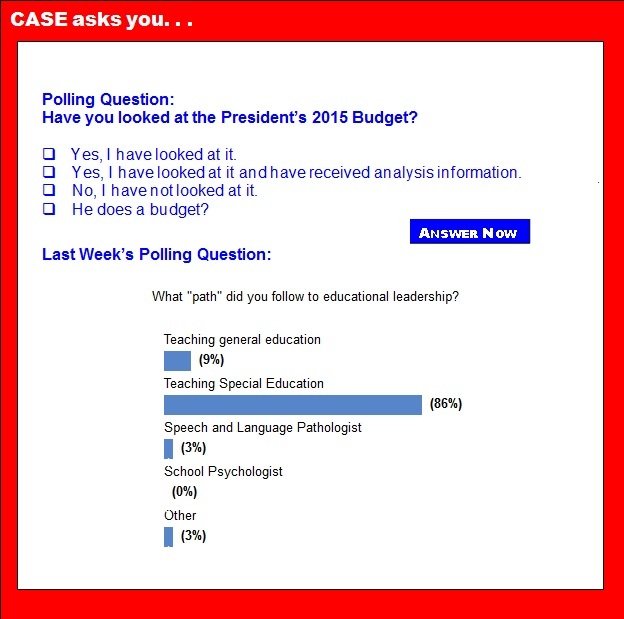 Did you know that CASE has been presenting a great session for the last 5 years on What Every Aspiring SPED ADMIN Needs to Know at the CEC Convention? Goal 3 of the CASE strategic plan states, "CASE will be active in the development and mentorship of special education administrators. The CASE leadership realized that what better opportunity to "expose" teachers to the joys and "how to" of the special education administration career ladder than at the CEC convention. So, if you have teachers attending CEC who would benefit from this great session, please encourage them to attend and if you are available at that time (Friday, April 11 10:30-11:30 room 204C in the convention center) come join us. It is always a well attended, exciting session filled with encouragement as we see ourselves as we were a "few" years ago! Lots of exciting things going on at CEC — See you in Philadelphia! Call to Action: Help CEC Advocate for Increased Special/Gifted Education Funding. [Special from CEC Policy and Advocacy Unit] If we have learned anything from observing Congress over the last few years, we know to anticipate major debates about how much federal funding should be invested in education programs. Just last year, communities across the nation were hit hard by sequestration — the 5 percent cut to all federal programs which slashed over $600 million from special education programs alone. Then this year, after major uproar ensued, thanks to advocates like you, we saw Congress reverse many of these cuts. But now, we are again preparing to debate why it's important to invest in special/gifted education programs, and we need your help! In early March, President Obama set forth his budget for the Fiscal Year 2015, proposing to largely level fund special education programs. CEC has called on the President and Congress to reverse this course and follow the lead of a bipartisan group of lawmakers who are calling for full funding of IDEA. In February, 130 members of the House of Representatives sent President Barack Obama a letter urging a greater investment in IDEA programs. And in March, Congressmen Chris Van Hollen (D-MD), David McKinley (R-WV), Tim Walz (D-MN), Chris Gibson (R-NY), Jared Huffman (D-CA), and David Reichert (R-WA) introduced the IDEA Full Funding Act, legislation that would fulfill Congress's nearly 40-year commitment to fully supporting IDEA by 2025. CEC is always a vocal advocate for special/gifted education programs through this process and relies on the strong voice of its members to share with policymakers the impact this funding has on children and youth with exceptionalities. Share how special/gifted education funding has impacted you and your students by emailing CEC's policy team at pubpol@cec.sped.org, stories may be shared with Congressional offices. Students at Christa McAuliffe Middle School, in Palm Beach County, Fla., are using an innovative cognitive cross-training program to enhance critical executive function skills in the classroom. The NIH funded program was designed by the leading neuroscientist at the Yale School of Medicine to target the eight most critical areas of executive function including: Sustained Attention, Working Memory, Speed of Processing, Response Inhibition, Cognitive Flexibility, Category Formation, Pattern Recognition and Multiple Simultaneous Attention. The program is a combination of a game like computer program and an adaptive physical education curriculum that feeds real-time data to teachers and administrators on the exact status of a student's Executive Function skills at any given time. CEC-Endorsed Legislation Introduced to Fully Fund IDEAIt's been nearly 40 years since Congress pledged to individuals with disabilities, their families and educators that the federal government would fully fund the Individuals with Disabilities Education Act. But, Congress has yet to reach this goal. Now, some members of Congress are trying to correct this course and have introduced legislation that would fully fund IDEA by 2025. Last Friday marked the start of the eleventh Paralympic Winter Games, which are a major international multi-sport event for athletes with disabilities governed by the International Paralympic Committee, currently being held in Sochi, Russia from March 7-16. The Games will feature 72 medal events in five sports. Special education advocates might be feeling a bit of bridesmaid's syndrome right now. Early education continues to get attention from the White House — though whether administration plans will come to fruition in a skeptical Congress is another story. Between societal changes and technological breakthroughs, it's become abundantly clear that the human brain is transforming the way it processes and learns information. While there are many discussions about whether or not this is good or bad for us as a society, it's definitely a change. As educators, it's our job to make sure that students and adults are learning. Part of that process isn't only about making an engaging activity or lesson, but also realizing how the modern brain learns. Steve Scher talks with actor and comedian Henry Winkler and author Lin Oliver about writing children books. The two have released the latest book in the "Here's Hank" series. This time, the words are printed using a font that makes it easier for children with dyslexia to read. Winkler, who is well known for playing "The Fonz" in the 1970s TV sitcom Happy Days, said he struggled with dyslexia from an early age. Special education advocates might be feeling a bit of bridesmaid's syndrome right now. Early education continues to get attention from the White House — though whether administration plans will come to fruition in a skeptical Congress is another story. But the funding for special education, about $11.5 billion for fiscal 2014, is proposed to remain at $11.5 billion for fiscal 2015. Without doubt, the goal of providing a quality education, no matter their physical, mental or developmental challenges, cannot be argued. Every child has the right to an education. Federal Individuals With Disabilities Education laws have codified this right to an education and the federal government's obligation to provide funding. Unfortunately, the federal government has not provided the funding they promised. Eight minutes into a public meeting on how to reform California's vast special education system, the woman who ran special education in rhe state for nine years came up to the microphone. Alice Parker was blunt. "I wish I could have a 'do-over' for the 45 years I worked in special education," Parker, who retired in 2005 as director of the California Department of Education's Special Education Division, told representatives of a new Statewide Special Education Task Force at a public forum. Construction is set to begin on a first-of-its-kind hotel where teaching and employing people with disabilities will be just as important as accommodating overnight guests. At least 20 percent of workers at a 150-room Courtyard by Marriott being built in Muncie, Ind. will be individuals with developmental and other types of disabilities, project organizers with The Arc of Indiana said. These employees will be working in all types of positions, including management. Some big changes could soon be coming to Michigan's special education program, prompting parents and advocates of special needs children to raise concerns. The Michigan Department of Education recently held two public hearings, in Detroit and Lansing.